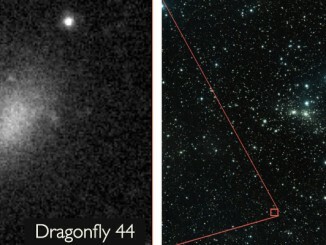 Yale University astronomers have identified the first “changing look” quasar, a gleaming object in deep space that appears to have its own dimmer switch. The discovery may offer a glimpse into the life story of the universe’s great beacons. The Yale team analysed a variety of observation data, including recent optical spectra information and archival optical photometry and X-ray spectra information. They needed to rule out the possibility the quasar merely appeared to lose brightness, due to a gas cloud or other object passing in front of it. 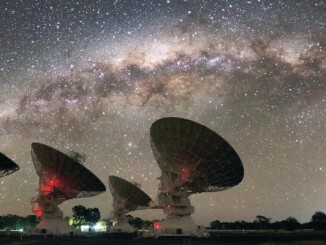 According to a team of astronomers led by Dr. Keith Bannister of CSIRO Astronomy and Space Science Division in Australia, invisible noodle- or shell-shaped plasma structures could be floating around in the Milky Way. These structures, which focus and defocus radio waves from distant sources such as quasars, could radically change our ideas about the Galaxy’s interstellar gas. 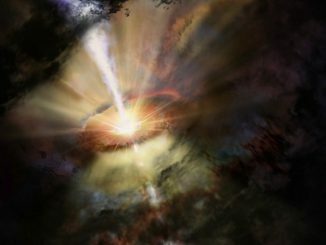 An international team of astronomers using the Atacama Large Millimetre/submillimetre Array (ALMA) has witnessed a cosmic weather event that has never been seen before — a cluster of towering intergalactic gas clouds raining in on the supermassive black hole at the centre of a huge galaxy one billion light-years from Earth.